the person who takes the initiative to act or speak out, will be the one who reaps the rewards of their actions. For travellers who are after all, guests in another destination, the lesson in #1 is obvious (I hope). As far as taking positive initiative goes (#2) it is something that can result in a memorable people experience, a unique souvenir, an upgrade in accommodation or transportation, and lots of stories to tell your friends who will inevitably ask “you really did that”? A few real-life travel examples will demonstrate what I mean. A) In the town of Takayama I saw a beautiful poster on the wall of a local restaurant. It featured an Ema—a drawing of a horse which is traditionally posted at the entrance of a home to invite happiness and good luck. I noticed that there were in fact two posters and having been through most of the shops in town, I knew that this was a unique poster. I asked my Japanese friend to ask if I could have one of the posters. He looked at me like I was out of my mind. I suggested that he mention that I was from Canada and that they had a duplicate poster on the wall, and that I would love to have this one in my office. So he asked. The owner said that unfortunately she could not take down the poster. We finished our meal, paid our bill, smiled and she once again apologized. A few minutes later, we heard a lot of yelling and turned around. The entire staff of the family restaurant stood outside holding the poster and beckoning for us to return and claim it. We did followed by several minutes of shaking hands. Laughter, and thank you’s and smiles. The poster graces a wall in my home to this day, and it brings back wonderful warm memories of Takayama. All we had to do was ask. The owner called over the manager who explained that these plates were no longer produced and therefore she could not sell or give us even two of them. So be it. When we went to the cash register to pay our bill later in the evening, the manager proudly handed me a small package –two dishes wrapped carefully in tissue paper. She apologized that they were used (as opposed to new) but she wanted us to have them. The result: Smiles, laughter, hand shakes and excited farewell greetings in both Japanese and English. C) On two occasions, we booked package tours (Flight and hotel) to visit Hiroshima, on one trip and Kochi, on another. The routine is to present a voucher on arrival at the assigned hotel and you are provided with the standard tour group type room. On both occasions, after looking at the assigned room, we decided that it was sufficient, but…. And on both occasions I was told, “But it’s a package tour rate, Steve. You can’t ask for an upgrade”. And that’s all I needed to egg me on. On both occasions, without even mentioning my travel credentials, I returned to the room after visiting the front desk and speaking with the hotel manager, to advise that our new executive suite was waiting for us. All we had to do was ask politely, ask the right person and of course exercise patience while the room allocations were checked. D) And lastly there was that memorable time in the small town of Otani in Shikoku. We read that there was a sake brewery and that they offering sampling from time to time in the off -season. We arrived just after noon and were asked to return at 1:00 pm. 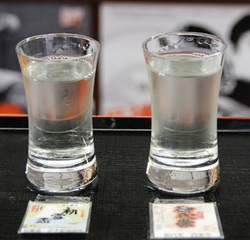 When we did return, they asked if we had made an appointment to sample the sake. We had not. They said it didn’t matter and then went out of the office to find some sake for us to sample! Eventually the woman we had chatted with came back with four unopened bottles and two glasses. She opened them one at a time, giving us a taste of the contents and giving us a bit of an explanation of the characteristics of that bottle. After the fourth sample she asked if we wanted to re-sample any of the sakes. We chose the first bottle. Then she asked if we wanted to just drink any of the sakes. Again, we really liked the first one so we chose it. Then she asked if we wanted to buy any of the sakes. We chose the first and second bottles. And then, as she put two unopened bottles in a shopping bag, she said that we should take all four of the sampling bottles with us too, as there were no other samplings scheduled! So we paid about $20.00 for two bottles, and left with another $50.00 in free sake. Friendship, laughter, photos, smiles and handshakes. A good memory for the brewery staff and a great one for us. Whether the culture of a country tolerates outspoken behaviour or whether it is frowned upon, travellers can ask for a favour as long as they do so in the appropriate circumstance, the appropriate manner and with a personable, humble and respectful attitude. You will be amazed what kind of travel memories you can generate and what kind of friendship and goodwill you can cultivate. In the context of Japan, I guess the expression is “The Squeaky Wheel gets the Sake!